Pour the Chex Mix™ into a large bowl. Start with 1 Tablespoon of taco seasoning and toss it with the Chex Mix™. If you want a stronger Mexican flavor add an additional Tablespoon of taco seasoning. How many of you have eaten an entire bag of Chex Mix™ by yourself? Gulp. Yes, we all know it’s addicting, but I think most of us can agree that Chex Mix™ is one snack that is meant to be shared. 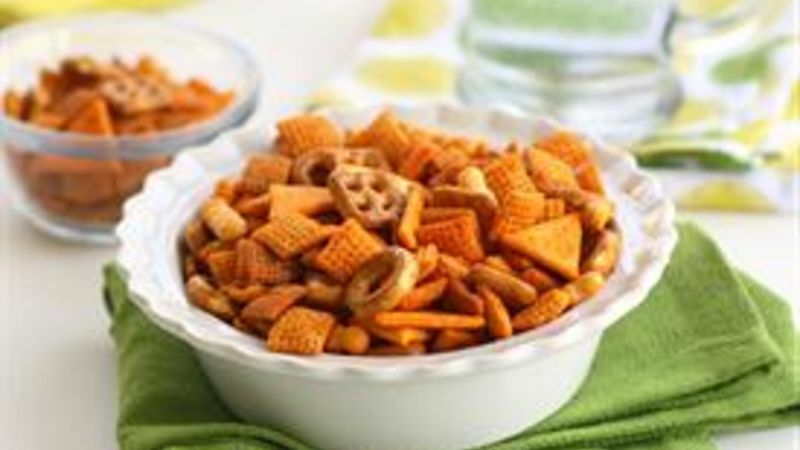 When you think of parties, Chex Mix™ is always in the spread of party food. What I love most about Chex Mix™ is that it’s flavorful enough that you can absolutely eat it plain but is also versatile enough to customize by tossing in your own add-ins. Amp up your next party with this Mexi-Chex Mix™ which is my Mexican twist on the classic Chex Mix™. You only need two ingredients for this spicy kicked up Mexican-inspired version -- just Chex Mix™ and Old El Paso™ taco seasoning. I prefer the cheddar Chex Mix because I can’t imagine any Mexican themed food without cheese flavor in there. You can adjust how much heat you want in this by how much taco seasoning you add. Toss the two ingredients together in a big bowl and your snack mix is done. Why spend all your time in the kitchen when this party mix is ready to get the party started?! So whether it’s an impromptu party or a party you’ve planned for weeks, this quick party snack is a crowd pleaser!